From May 31 to June 4, 2012 the Third Ordos International Auto Exhibition was held on Mongolia Ordos Kangbashi International Exhibition Center, it sponsored by Ordos Municipal People's Government and CNAICO, jointly organized by Ordos City Kangbashi Management Committee, China Sungoal (Beijing) Exhibition Co.,Ltd and Inner Mongolia Creative Culture Communication Co., Ltd. This exhibition with"pulse Northwest automobile market, to create local high-end automotive marketing platform" as its theme, is committed to creating the best automotive marketing platform and most professional automotive exhibition in Inner Mongolia. Exhibition area were​​35,000square meters, bringing together nearly 60 well-known car brand exhibitors, 216participatingmodels, flowing capacity of 128,000 visitors, On-site transactions and intentionorders nearly 4,000 units, achieved total sales of 800 million Yuan. 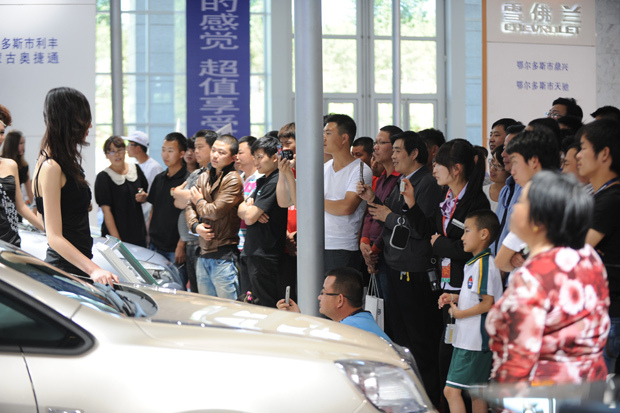 As Ordos’s largest and highest grade automotive exhibition in this year, Ordos International Automotive Exhibitionnot only attracted local and surrounding public concern, but also more numerous professionals were present. Due to the rapid economic development and leading automobile consumption level of the Ordos, this exhibition has attracted, including Bentley, Aston Martin, Ferrari, Maserati, and nearly 40 top luxury vehicles, Refitting vehicles andRVs. Meanwhile, many luxury Promotions Activity and Perfect Experience. A professional exhibition not only offering a professional marketing platform for the majority of exhibitors, Alsoproviding an excellent exchange platform for the majority of car enthusiasts and buyers. The perfect cooperation of Organizing Committee, the Bank of China and ChinaMobile bring a lot of convenience for the audience. This exhibition not only participating by a national authority media, but also broadly supported by the major television stations, radio stations, network broadcast, print media, DM magazines and local integrated media, andexpanded influence through large-scale LED, taxi LED and other pavementpublicity. The influence of rapid expansion of this exhibition led tothe rapid development ofrelated industries including transport, communications, tourism, services，etc. Similarly the Fourth International Automotive Exhibition organized by CNAICO and HohhotPeople's Government, will be held from July 13 to 17 at Hohhot International Exhibition Center in Inner Mongolia. The Fourth Hohhot International Automotive Exhibition estimated total exhibition area of ​​over 50,000 square meters,as the renowned brand exhibition of CNAICO, that will continue thenew resplendence of northwest automotive exhibition withOrdos International Automotive Exhibition.